This six-week book and Bible study will guide Christians into the why’s and how’s of prayerwalking. It includes practical exercises. It could be under the “book” category or the “study” category. Review: Randy Sprinkle has a passion for Christians to have individual intimacy with God. You were created to walk with God! He also deeply desires for Christians to live for God’s glory and Christ’s Kingdom mission work, which is fulfilled through prayer. The author’s purpose behind the study book is not for the reader to learn about prayer walking, but for the reader to become a prayer walker. It is designed for individuals who will complete a 30-minute study each day, practice what they learn, and then gather weekly with a small group to discuss what they learned and prayer walk together. 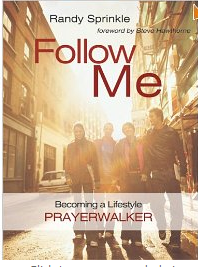 The book is geared towards those who are new to prayer walking. The book study is six weeks in length. Each week has five days of studies. Starting on week three, you will be encouraged to participate in a brief personal prayer walk each day. A facilitator’s guided is located at the back of the book. Each week’s key scripture could be used as a memory verse. Each day’s study includes “Beginnings” (a short Bible study to be completed in the morning), “Throughout Today” (thoughts to integrate what you learned into your everyday life), and an “Evening Reflection.” This is not a study one should hurry through. To get the optimal benefit, focus on completing just one lesson per day. The author spoke from his own prayer walking experience, and he also shared uplifting stories from the experiences of others from around the world who have had divine encounters through their own prayer walking. This study would be an excellent introduction to prayer walking and could be used by a Prayer Group leader with his or her prayer group or by a pastor/church leader who desires to teach others about prayer walking. Although the study could be done individually, a group setting would add a greater dimension to the learning experience. The author believes that “Prayer, contrary to popular opinion, is not primarily asking God for things, but rather being with God. . . . Prayer is not incessant talking to God but unceasing walking with God.” I found the author’s emphasis on prayer within one’s personal life as well as within the context of the local church refreshing.